Today’s recipe is a pumpkin-centric fusion recipe of my mother. Mix the flour, margarine, salt and a little water to make a dough. Knead to make it smooth and let the dough rest while making the tart filling. Heat a tbsp of oil in a pan and fry the ginger and garlic first for a couple of mins. Then, add the chopped onion followed by the chopped vegetables. Stir fry for a few mins. Finally, add the boiled pumpkin and carrot as well as the guava. Mix well and continue cooking for about 5 mins. Season with salt and pepper. Remove pan from stove. Heat 2 tbsp margarine in a saucepan over low heat. Add 2 tbsp flour and add ½ cup of water to the saucepan. Stir, for about 10 mins, until it thickens to a cream. Add salt and pepper, to taste, and optional ½ tsp vegetable stock and 1 tsp crushed chillies. Transfer the vegetable mixture from the pan to the saucepan. Stir. Add ½ tsp baking soda to the saucepan. Mix well before removing sauce pan from stove. Roll out the dough and line the pie tray with the dough. 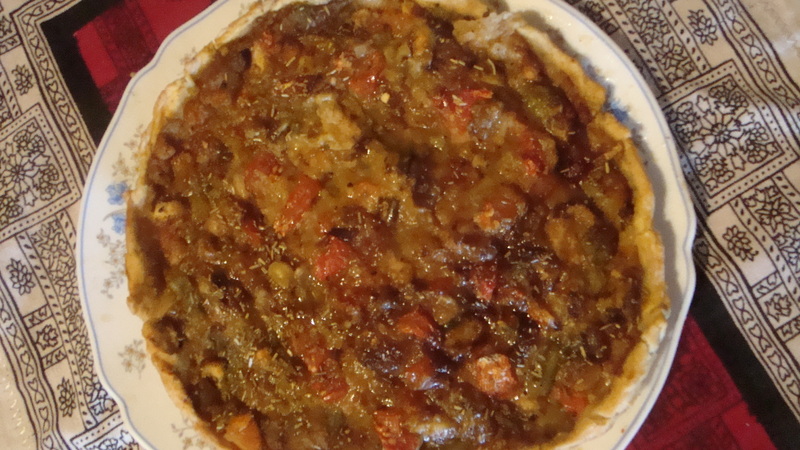 Fill the tart base with the vegetable filling. 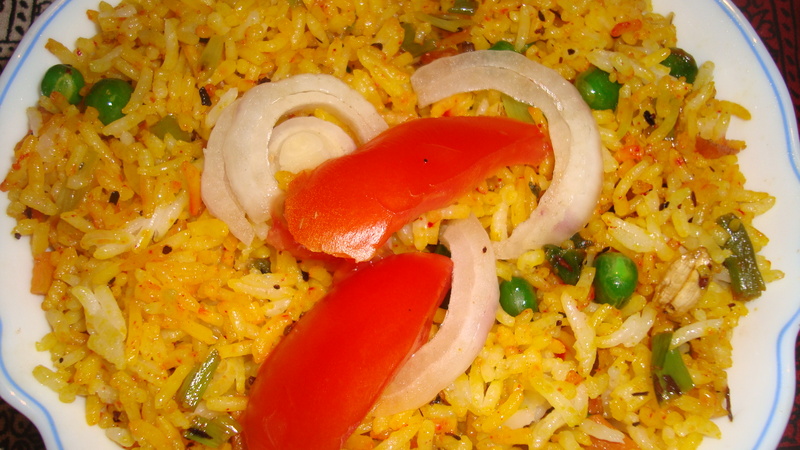 Top with chopped tomatoes and optional chopped onions. Sprinkle 1 tsp of rosemary or mixed spice. Bake the tart at 220⁰C/428⁰F for 30 mins. 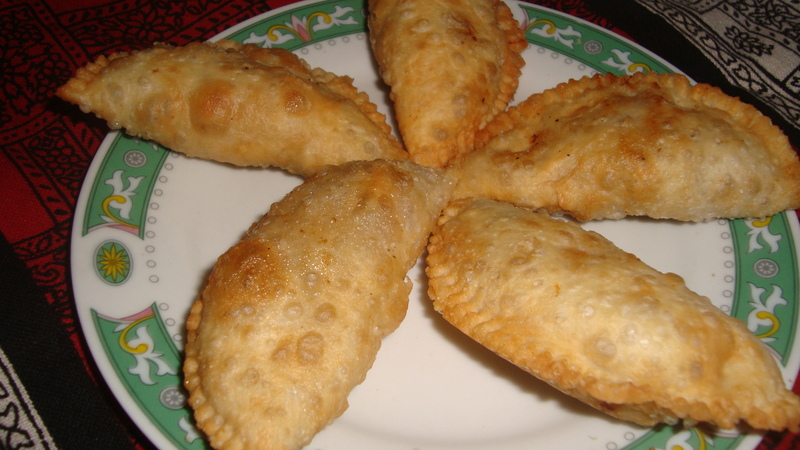 Today’s recipe is that of savoury patties, a regular tea-time snack made by my mother at home. Mix 1 tbsp oil with the flour and salt and stir in ¼ cup of hot water, kneading into a dough. Divide into 14 balls. Brush with some oil. Boil the potato and mash it up. Add salt to the mashed potato. Boil the carrot, cabbage, beans and the green peas. Mash them up and add a little salt. Heat 1 tbsp oil in a pan and fry the onion, ginger and garlic for a couple of mins. Add the fennel seeds and curry leaves and stir. Add the mashed and chopped vegetables, except the potato, and the chopped leeks and celery to the pan. Add 2 tsp curry powder and stir fry for a few mins. Add the mashed and boiled potato to the pan. Mix well and continue frying for a few mins. Remove pan from stove and divide filling into 14 portions. Roll out each of the 14 balls of dough into circular shapes. Spoon the filling into the center of the circular dough. Fold the dough over the filling in a half-moon shape, by hand or using a patty mold. Heat the oil for deep-frying. Fry the patties, a few at a time, until they are golden brown all over. Transfer fried patties to a tray lined with grease absorbing paper. Update (04/07/4014): I just came across the Soups with SS event being hosted by Sonal and Shruti through the delicious soupe au pistou post of Angie. I wanted to share the only soup recipe that I have posted on my blog to-date. 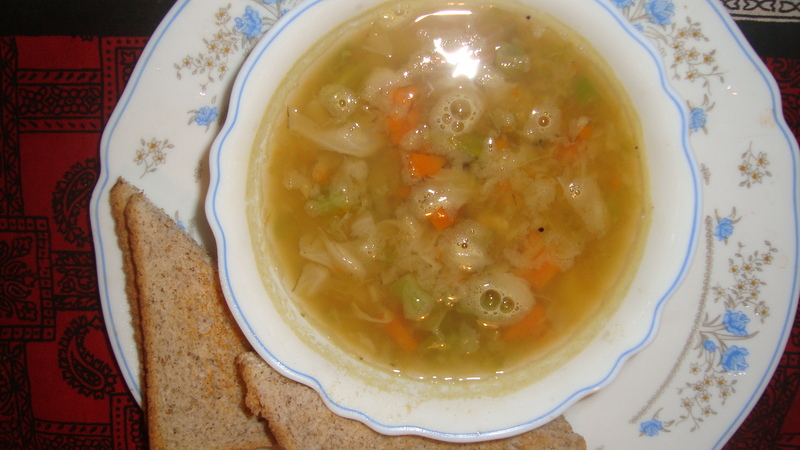 It is a simple vegetable soup. Today’s recipe is my mother’s recipe for her favourite soup which she makes almost on a weekly basis at home. Clean and chop the vegetables and place them in a soup pot/ pan. Add 4 cups of water and cook the soup for about 20 mins. Remove from stove and let the soup cool a little. Transfer half the soup to a blender and blend. Return the blended soup to the soup pot. Add salt and pepper, to taste, and garlic flakes to the soup pot. Mix well. A vegetable cube can also be added, if you like. Cook for few mins and warm up the soup. Just before serving, add some optional lime juice. 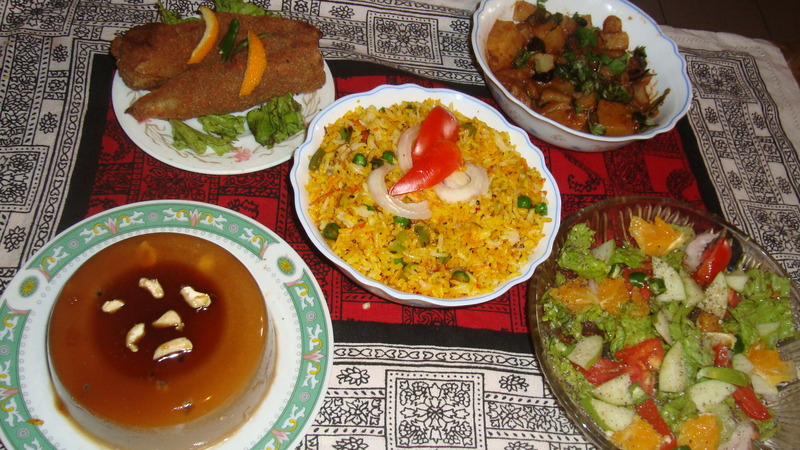 To celebrate Eid al-Fitr, my mother prepared a special lunch today: fried rice with potato curry, stuffed chilli fry, salad and wattalapam jelly pudding. So today, I will share my mother’s recipes for all five dishes, which comes under experimental and fusion cooking, in a series of posts. Put the rice in a rice cooker and add water to about an inch above the rice surface. Add a cinnamon stick, rampe leaf and a little salt and cook the rice. Sprinkle a little salt on the chopped veggies and keep aside. Heat the margarine in a pan on low heat. Add the mixed 3C spice powder and sauté for 2 seconds before adding the chopped vegetables.